The IUPAC name of Dihydromyricetin is (2R,3R)-3,5,7-trihydroxy-2-(3,4,5-trihydroxyphenyl)-2,3-dihydrochromen-4-one. 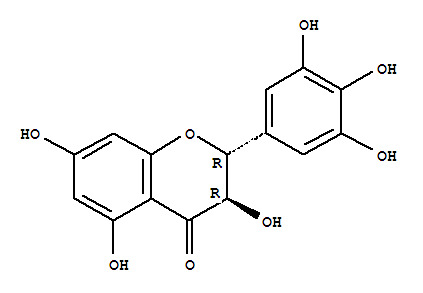 With the CAS registry number 27200-12-0, it is also named as Flavanone, 3,3',4',5,5',7-hexahydroxy-. The product's category is Flavanones. It is a flavanonol, a type of flavonoid. It can be found in the Japanese Raisin Tree Hovenia dulcis. The compound is credited with hepatoprotective effects. The other characteristics of this product can be summarized as: (1)ACD/LogP: 1.23; (2)# of Rule of 5 Violations: 1; (3)ACD/LogD (pH 5.5): 1.22; (4)ACD/LogD (pH 7.4): 0.71; (5)ACD/BCF (pH 5.5): 4.94; (6)ACD/BCF (pH 7.4): 1.52; (7)ACD/KOC (pH 5.5): 108.36; (8)ACD/KOC (pH 7.4): 33.33; (9)#H bond acceptors: 8; (10)#H bond donors: 6; (11)#Freely Rotating Bonds: 7; (12)Polar Surface Area: 147.68 Å2; (13)Index of Refraction: 1.798; (14)Molar Refractivity: 75.6 cm3; (15)Molar Volume: 177.1 cm3; (16)Surface Tension: 115.7 dyne/cm; (17)Enthalpy of Vaporization: 119.16 kJ/mol; (18)Vapour Pressure: 1.16E-25 mmHg at 25°C; (19)Rotatable Bond Count: 1; (20)Tautomer Count: 999; (21)Exact Mass: 320.053217; (22)MonoIsotopic Mass: 320.053217; (23)Topological Polar Surface Area: 148; (24)Heavy Atom Count: 23; (25)Complexity: 445. Preparation of Dihydromyricetin: It can be obtained by (2,4,6-tris-methoxymethoxy-phenyl)-[3-(3,4,5-tris-methoxymethoxy-phenyl)-oxiranyl]-methanone. This reaction needs reagent 12percent methanolic HCl and solvent methanol at temperature of 50 °C. The reaction time is 20 min. The yield is 71%. Uses of Dihydromyricetin: It can react with sulfuric acid dimethyl ester to get (+/-)-ampelopsin pentamethyl ether. This reaction needs reagent K2CO3 and solvent acetone by heating. The reaction time is 6 hours. The yield is 58%. mouse LD oral > 5gm/kg (5000mg/kg) Zhongguo Yaoxue Zazhi. Chinese Pharmacuetical Journal. Vol. 31, Pg. 458, 1996.
mouse LD50 intraperitoneal 1410mg/kg (1410mg/kg) Zhongguo Yaoxue Zazhi. Chinese Pharmacuetical Journal. Vol. 31, Pg. 458, 1996.